Create a white snow theme any time of the year with D'ziner Snow. D'ziner Snow is a versatile, cost effective, realistic & revolutionary fake snow product. You've never seen anything like D'ziner Snow. 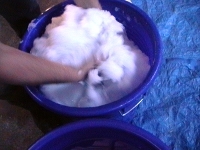 Looks & feels exactly like snow. It will amaze you, your friends, your neighbours, everyone! Used all year round in shop displays, weddings, functions, birthdays, themed parties, snow parties, winter parties, xmas parties, snow hobbies...all sorts of fun! Polymer Innovations D'ziner Snow is a unique polymer bead that absorbs large amounts of water. 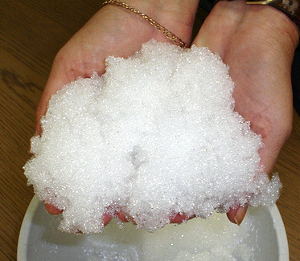 Just a small amount of this polymer powder added to water transforms into sparkling white snow in minutes. Polymer Innovations D'ziner Snow polymer beads when kept out of UV light, dry, clean & free of contaminants can be reused again & again! It is as close as you can get to the slopes without going there! Unlike some inferior products, D’Ziner Snow is made from a spherical polymer bead, which ensures a bright, glistening, realistic look. Step 2: Stir water while adding D'ziner Snow to prevent "gel-blocking"
Step 5: Your D'Ziner Snow is now ready for play or display!! For more information please refer to our D'ziner Snow FAQ page.